This page is here to provide me with a few links to help me in the event of the inevitable memory loss. 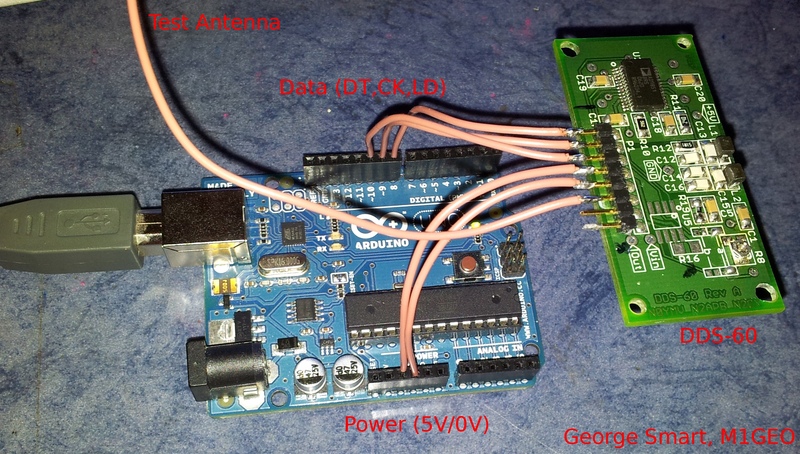 This page details how I got my DDS-60 AD9851 DDS board to generate signals from an Arduino. My code is using that developed by Peter Marks, blog.marxy.org. It works pretty much perfectly. I use advised pin configuration, with the notable exception that I power my DDS-60 board from the USB 5V supply from the computer, as it saves on regulators getting warm. Remember to change this (should you need) to use the DDS-60’s regulator rather than the Ardunio’s in the event of external power. It should be noted that the above image was a proof of concept and was later made into a more physically strong configuration.